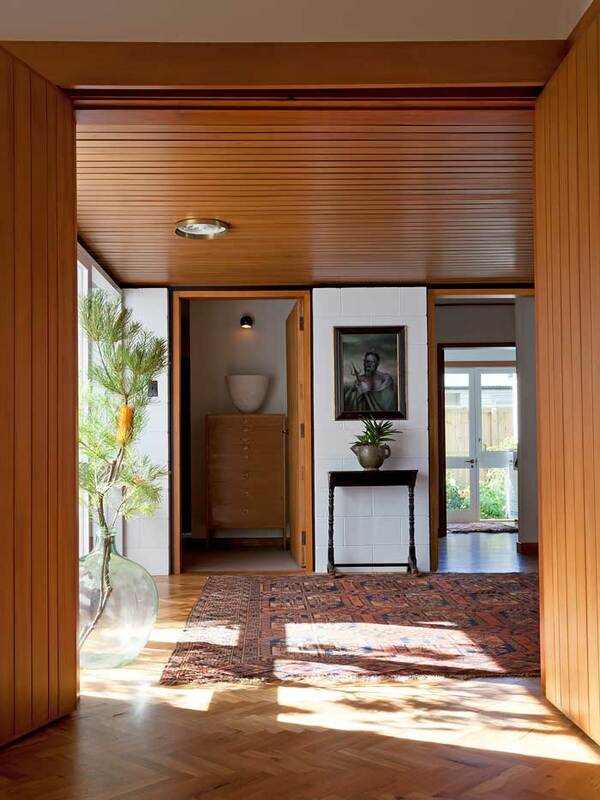 This is a book of pictures of modernist, mid-century New Zealand homes. The houses aren’t new, they’re old and lived in. 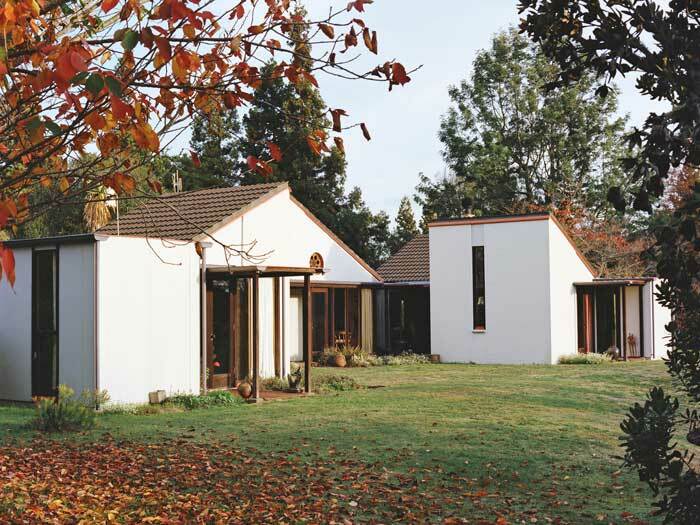 Photographer Mary Gaudin and writer Matthew Arnold show us the timelessness of these simple yet elegant dwellings. They can be a little dusty, slightly worn around the edges and all have what antique dealers like to call “patina”. But they’re perfect in the minds of the people who live in them because of what they represent, which when designed, was a better way of living. The idea for the project wasn’t so much to document the houses in purely architectural terms, but to give an idea of the way these houses were and are lived in, as well as showing details of the designs and the materials used in their construction. The use of native timbers throughout these houses has given a unique feel to the interiors. 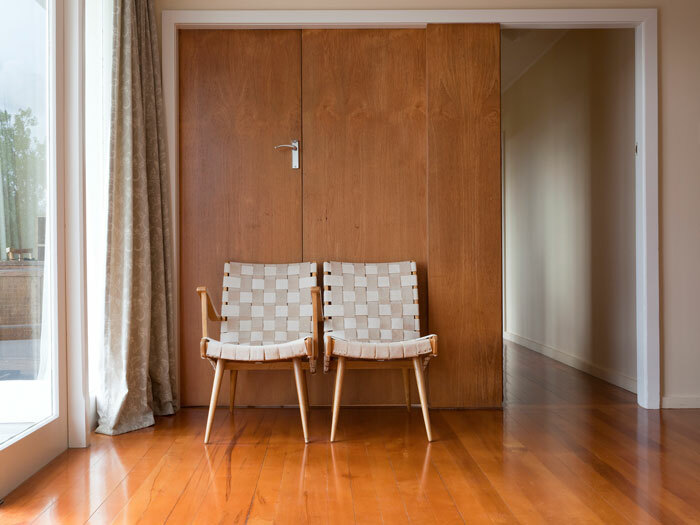 Rimu was often used for cupboard doors and matai, a wood which darkens with age, for handles. We also wanted to look at the way these houses fitted into their surroundings. 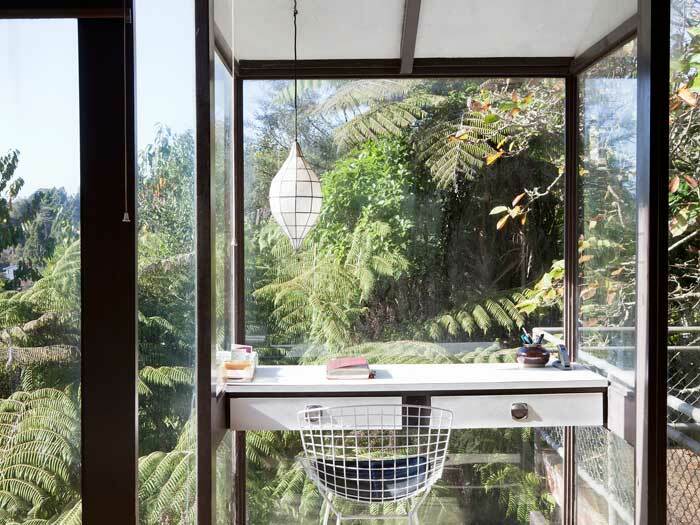 All of the Wellington homes are connected to native bush, attracting tuis, fantails and bellbirds amongst other native birds. The owners of the Einhorn house, which backs onto the Karori bird sanctuary, sometimes see rare hihi feeding in their garden. 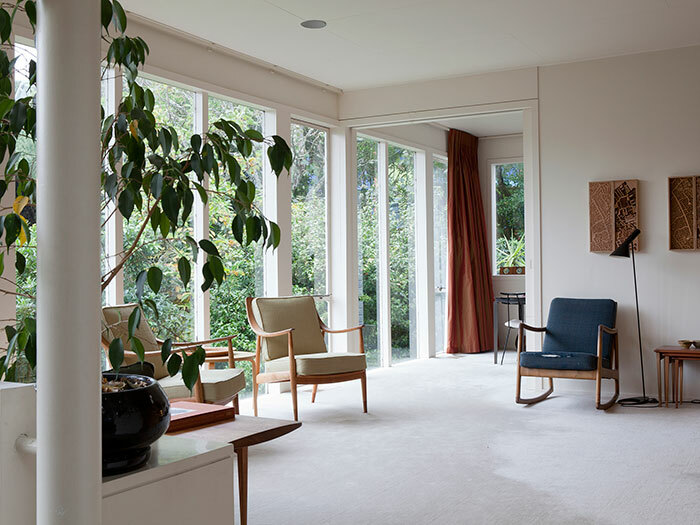 The front of the Manning house is surrounded by an enormous pohutukawa tree which, from inside the house filters views out towards Auckland Harbour Bridge. The title of the book comes from a phrase in an email from Bruce Martin giving directions to his home at Bridge Pa. 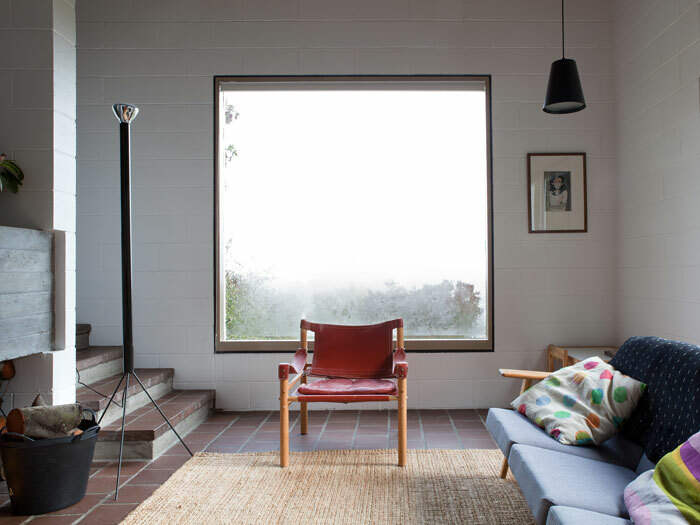 Filled with a lifetime of pottery both from Bruce and Estelle’s work, together with gifts from potter friends, the Martin’s home highlights the particular mix of craftsmanship and design which is reminiscent of all the homes shown in this book. Mary Gaudin and Matthew Arnold. 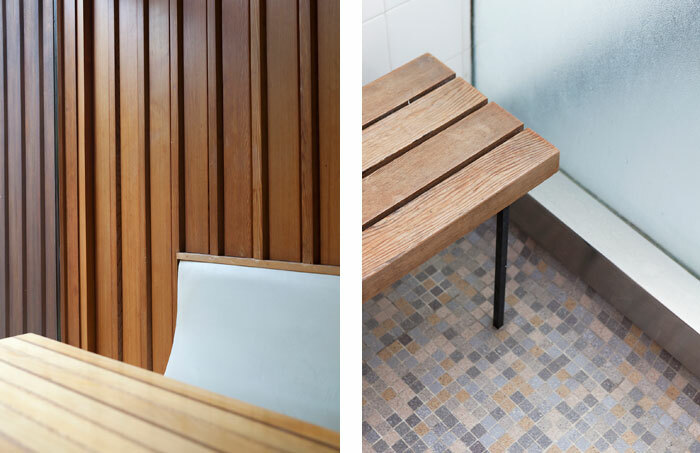 Photographs by Mary Gaudin, a New Zealand photographer living in Montpellier, France. Text by Christchurch Modern blogger Matthew Arnold. Read more about the book Down the long driveway, you’ll see it.